Wild mint is often used as a domestic herbal remedy, being valued especially for its antiseptic properties and its beneficial effect on the digestion. Like other members of the genus, it should not used by pregnant women because large doses can cause an abortion. 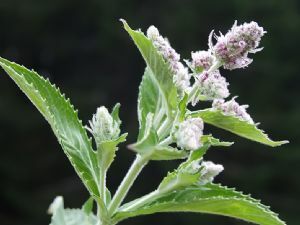 The whole plant is anaesthetic, antispasmodic, antiseptic, aromatic, and has agents that counteract inflammation, that relieve and remove gas from the digestive system, induce sweating, promote or assist the flow of menstrual fluid, promote secretion of milk, relieve fever and thirst, give strength and tone to the stomach, and is a stimulant. 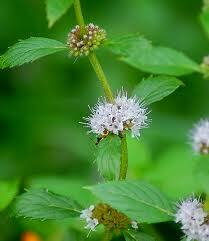 The leaves of wild mint are edible, raw or cooked. Having a quite strong minty flavor with a slight bitterness, they are used as a flavoring in salads or cooked foods. A herb tea can be made from the fresh or dried leaves. The North American tribes used the leaves to make tea or beverages, to spice pemmican and soups, and to add flavor to certain meats in cooking. Plant parts were packed in alternate layers with dried meat for storage. An essential oil from the plant is used as a flavoring in sweets and beverages. The leaves contain about 0.2% essential oil.